What is The Fish Society? Established 25 years ago, The Fish Society is the UK's premier internet fishmonger. Why is your delivery so expensive? Fish is very perishable. Our be deliveries must be reliable and fast. Delivering frozen fish requires expensive packaging, rapid transit and insurance against occasional but inevitable delays which may result in defrosts and writeoffs. These are rare (approx 1 in 200) but they are a reality. For these reasons, our delivery charges are higher than those for books, clothes or similar. Do you sell fresh fish? Why freeze fine fish? We only sell frozen fish. We guarantee that it is of the highest quality and we will refund your money if you do not agree. Why do we sell only frozen fish? Because we believe freezing fish soon after it is landed (typically 1-4 days depending on the type of fish and where it is coming from) gives you a better experience than eating fresh fish may be kept chilled for up to a week. We believe that OUR frozen fish will give you the same eating experience as buying fish at the quayside and eating it straight away. We conducted a live experiment on the Radio 4 Food Programme. This involved taking two fillets from the same fish (a large halibut). It was a very fresh fish. One fillet was frozen and the other was kept fresh. Both were cooked in the same pan using the same (simple) recipe. None of the guests on the programme could distinguish the fresh fillet from the frozen fillet. Frozen fish is highly convenient and unlike fresh fish, does not need to be eaten immediately. It is a myth that frozen fish is inferior to fresh (although the myth is logical, for the reasons explained under "Why does frozen fish have the reputation of being inferior to fresh fish?"). What counts is the quality of the fish that was frozen. Why does frozen fish have the reputation of being inferior to fresh fish? Because a lot of frozen fish is indeed of inferior quality at the point of freezing. Not all fish is of equal quality when landed. It is a natural consequence that frozen processors tend to buy the less expensive, inferior fish, thus traditionally leaving the better, more expensive fish, for the fresh fish trade. We buy our fish alongside fresh fish processors, paying whatever price is necessary to maintain our reputation for quality. If you buy fresh fish to freeze yourself, then unless you are dealing with only a small quantity, you are unlikely to get a good result. Freezing fish is a specialist process and needs to be completed very quickly - ideally within minutes. The longer the process takes, the larger the ice crystals formed in the fish. These crystals harm the muscle structure and result in a disappointing eating experience. You will not be able to freeze fish quickly enough in your home freezer, which will take ten or twenty times as long to freeze fish as a commercial freezing plant. Furthermore, frozen fish needs to be protected from the cold air surrounding it, which also harms the muscle structure. To prevent this harm, frozen fish should be vacuum-packed before freezing or lightly "glazed" after freezing. We might add that buying fresh fish is absolutely no guarantee of quality, anyway. As you know, fresh fish deteriorates very quickly. By the time it has made its way from the quayside to your fridge, it is often inferior to fish which was selected for quality immediately after being landed, and frozen straightaway. Fish is a global industry. More than half our products are sourced from abroad, via a complex supply chain. It's difficult for us to be sure what conditions pertained at the beginning of the chain. No mainstream fish retailer - us included - can put his hand on his heart and say "Everything I sell was caught or farmed in a sustainable manner". That said, when we can see a clearly sustainable option, we take it. Our cod and haddock fillets are come from Norway and Iceland, where strong government controls ensure fish stocks are well-managed. Our farmed fresh salmon comes from organic sources whenever possible. Most of our wild sea bass is rod-caught. We offer scallops which have been hand-caught by divers. (We also offer dredged scallops because the cost of diver-caught scallops is very high, but we tell you which kind of scallop you are buying and leave you to make the choice.) We could source many fish at a lower cost, but we have made choices which we believe are right. Nevertheless, some fish in our range provoke hard questions from environmentalists. These include tuna, whitebait, king prawns, eel and skate. These fish are all popular and widely available at present. The neat choice of dropping these fish from our range would decimate our business with no practical effect on supply. Only governments can prevent catching of over-exploited fish or the development of unsustainable fish-farms. Frozen fish often has an ice glaze. After freezing, the fish is briefly dipped in water resulting in a thin layer of ice being added. Glazing helps protect fish from "freezer burn" which is the process of cold air drying out the fish. You will be familiar with freezer burn from your home freezer - it affects anything that is not tightly wrapped. The ice glaze is a sort of tight wrapping. Historically, glazing was often abused. Many processors added extra glaze to make their fish appear cheaper. Historically, a pack could include up to 50% water in the worst cases - without this being stated. Depending on the shape of a type of fish, an "honest" glaze will add 5% to 20% to the weight. A lemon sole fillet is large and thin - the honest glaze will be about 15-20%. The honest glaze on a cod steak would be about 7%. In 2016 the EU required all glazes to be treated as if they were packaging and therefore excluded from all stated product weights. Vacuum-packing made honest glazing redundant in many cases. Vacuum packing is a more effective protection as long as the seal stays intact because - unlike a water glaze - it cannot be degraded by cold air. But not all fish can be vacuum packed satisfactorily. Spikey fish such as king crab legs will puncture most vacuum packs. 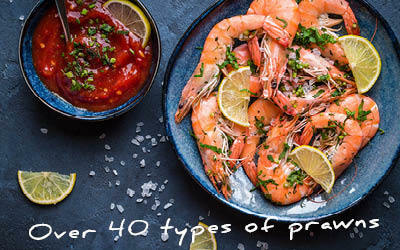 Small fish such as peeled prawns may end up all frozen together when vacuum-packed. So for these fish you should expect a glaze (typically 10%, sometimes 20% as old habits die hard). The pack weights on our website and labels are all deglazed weights. Thus if the fish weighs 1000g including a 20% glaze, we tell you the weight is 800g. However, that fish may still weigh less than 800g when you defrost it . This is because the process of freezing and defrosting fish causes some of its natural moisture to leak out. Typically the loss of weight involved here is 5%-8%. There is another means of making fish heavier which is to soak it in a diluted tasteless solution which makes it absorb water (a process similar to injecting water into chicken meat). Scallops are routinely offered in the trade as "soaked" or "unsoaked" with soaked about 15% cheaper. We never use soaked scallops. Is your fish frozen together or separately? Langoustines and some kinds of whole king prawns (our peeled prawns are always individually frozen), which would be damaged if allowed to jostle against each other. However, you can easily separate the fish you want to eat now from the rest by holding the fish under a running cold water tap to melt the ice between the fish. This task should never take more than two minutes. Wrap the fish you don't need and return to the freezer. Herring melts. It's just not economic to freeze small and floppy melts individually so they are frozen into a 450g/1lb block. You can still, however, use some now and keep the rest for later, by allowing the block to "semi thaw" for a couple of hours, then cutting it or pulling it apart. When you have separated it into portion-sized quantities, you can refreeze them. As long as you do not allow the block to come up to room temperature, you will not come to any harm from doing this. Kippers. Kippers freeze best when frozen in pairs, open side to open side. This helps protect the fish. However, you can semi-thaw your pair of kippers and tease them apart in just the same way (in fact more easily) as the melts. Who says your fish is good? BBC Good Food magazine described our fish as "Top Quality" and Good Housekeeping magazine called it "Exceptional Value". But the most important accolade is certainly from our members whose reviews are constantly updated HERE. How are you different from my supermarket fish counter? 1) We stock more kinds of fish than any other fishmonger – over 200 varieties. 2)The quality of our fish is never compromised. All fish is freshly frozen very soon after landing. Frozen fish should be defrosted only at the point of cooking and certainly should never be "left around" even if kept on ice. Many supermarket fresh fish counters and retail packs sell defrosted fish as if it was fresh. 3) We always seek to buy the highest quality grades of fish. This usually means - amongst other things - that we buy larger grades of fish. For instance, there are 12 grades of scampi based on size and glaze. Ours is the best and most expensive. It is large and totally unadulterated. It's expensive, but it makes fabulous eating. We try always to supply the best without compromise. How much fish should I be eating? According to the Food Standards Agency we should be eating at least two portions of fish a week including one of oily fish. But most people aren't eating enough fish. Fish and shellfish are rich in protein and minerals, and oily fish is rich in omega 3 fatty acids. Oily fish such as sardines, herring, mackerel, trout and salmon are all rich sources of omega 3 fatty acids, which help prevent heart disease. These fatty acids are also important for women who are pregnant or breastfeeding because they help a baby's nervous system to develop. Oily fish are also a good source of vitamins A and D.
Most people should be eating more oily fish because omega 3 fatty acids are very good for our health. I'm new to lobster - where do I start? We sell 2 kinds of lobster - European (or the very similar North American) lobster - which has claws, and Rock lobster, which is the same exquisite meat and taste, but this creature has no claws. European (and North American) lobster is sold whole. So you get the claws and also the head and torso - which has some gourmet parts, including the rich liver (or tomalley), although this is not to everybody's taste. With clawed lobsters, you get a lot of shell and about 35% edible meat. You never know how much meat is in the claws for sure until you crack them open. They can be packed with meat or they can be only half full of meat... it's almost random. Since rock lobsters have no claws, we sell them headless - you just get the tail. And that means you get 80%+ meat. We definitely recommend rock lobster for "the best in mouth experience". You get more meat for your money, and better meat - it's all in one lump. Our rock lobsters are raw. But they are easy to cook and it's easy to extract from the shell. The instructions are on the pack. Yet there is something special about the visual spectacle of a bright red lobster with claws. We offer these cooked or raw. We always recommend raw because you get "a better in-mouth experience" from a lobster you have cooked at the time of eating, than from a defrosted frozen pre-cooked lobster. Cooking a lobster is easy: defrost it thoroughly (overnight). Then place in a pan of boiling salted water for 15 minutes. Our pack includes full details. Despite our advice, most people buy ready-cooked lobsters, because they don't want to cook them themselves. Both kinds of lobster are easy to split down the middle either before or after cooking, as long as you have a large sharpish knife with a solid, non-bendy blade. Just hold the lobster down firmly (back down) and press your knife firmly through. I have no experience with cooking fish. What can you do for me? Most of our product packs have preparation directions. We also have a huge recipe library which is freely available on the recipe link at the bottom of our home page. If you can't find what you're looking for, call us on 01428 687768 - we'll be delighted to help. Don't give any fish or shellfish to babies younger than six months because they might have an allergic reaction. Children should avoid eating any shark, swordfish or marlin. This is because the levels of mercury in these fish can affect the development of a child's growing nervous system. Because it is occasionally a source of food poisoning, do not give raw fish to children. The NHS states that you can eat most types of fish when you're pregnant. But there are a few types you should avoid and some others where you should limit the amount you eat. See the NHS advice here. How and when do you deliver? All deliveries are made by an overnight parcel courier such as United Parcel Service or APC. Your order leaves us at 4pm (Monday to Friday) and is delivered to you the next day. Each item you order is vacuum-packed or packed in a high quality plastic bag and then in an insulated box. Your box contains dry ice to ensure your order stays frozen until the evening of the delivery day. We deliver on the date you specify when placing your order. You can choose any day other than Sundays, Mondays, bank holidays and the days following bank holidays. Most deliveries should arrive between 8.30am and 6pm and usually by 12 noon. Transit times to remote postcodes are longer. Do deliveries need to be signed for? No. When making your first order, please always complete the "IF OUT" directions. We then hold these along with your address details and will follow them for future orders until you change them. Typical if outs are "In garage" or "At front door". Please avoid asking for your fish to be left with a neighbour unless you are absolutely sure they will be in. What if I am not happy with your fish? Let us know. We will try to resolve the issue as quickly as possible. Can I amend my order, or change the delivery date? Yes and we can also change your delivery address, if necessary. Order amendments cannot be dealt with online - you'll need to call us on 01428 687768. Most order amendments can be dealt with up to 10am on the day before delivery. Yes. Call us on 01428 687768 by noon on the day before your delivery date.